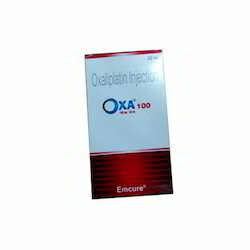 Offering you a complete choice of products which include oxaliplatin 100mg injection, epicure 100mg, biceltis 440mg, ikgdar 500mg inj, ikgdar 100mg inj and blaztere 4mg inj. 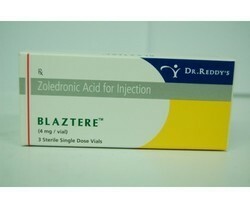 Blaztere 4 mg Injection is used in the treatment of osteoporosis. It treats osteoporosis in postmenopausal women and men at high risk of fractures. 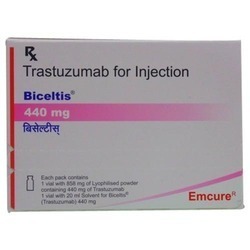 Blaztere 4 mg Injection is a bisphosphonate. It works by suppressing the activity of osteoclasts, cells that cause destruction of bone. This strengthens the bones and minimizes the risk of fractures. 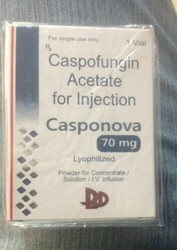 Casponova 70 mg Injection is used in the treatment of severe fungal infections. Casponova 70 mg Injection kills fungus by preventing them from making their protective covering. Category ovarian cancer,cervical cancer and testicular cancer. Usage/Application ovarian cancer, cervical cancer and testicular cancer. 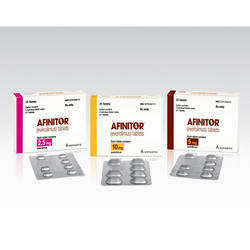 Cisplat 50 mg Infusion is used in the treatment of ovarian cancer, cervical cancer and testicular cancer. 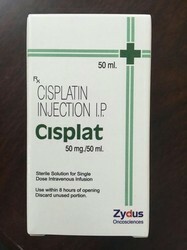 Cisplat 50 mg Infusion is an anti-cancer medication. It works by damaging the genetic material (DNA and RNA) of the cancer cells which stops their growth and multiplication. Usage/Application non-Hodgkin lymphoma (NHL), blood cancer (Chronic lymphocytic leukemia) and rheumatoid arthritis. 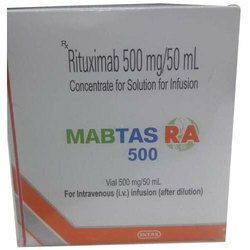 Mabtas RA 500 mg Injection is used in the treatment of non-Hodgkin lymphoma (NHL), blood cancer (Chronic lymphocytic leukemia) and rheumatoid arthritis. 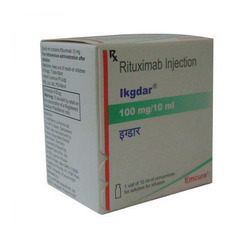 Mabtas RA 500 mg Injection is a monoclonal antibody that specifically binds to receptors on cancer cells. Thus it flags the cancer cells for destruction by the body's immune system. 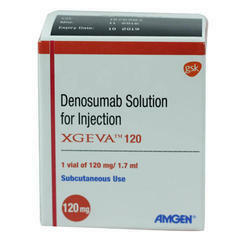 Xgeva 120 mg Injection is used in the treatment of osteoporosis. It is also used to treat bone loss in men with prostate cancer and in women with breast cancer who are receiving certain treatments that increase their risk for fractures. Xgeva 120 mg Injection is a monoclonal antibody. It binds to a protein that causes bone loss, thereby strengthening the bone and minimizing the risk of fractures. Casodex 50 mg Tablet is used in the treatment of prostate cancer. Casodex 50 mg Tablet blocks the effect of the natural male hormones on the growth of prostate cells. Casodex 50 mg Tablet also blocks the undesired effects of androgens in females such as excessive hair growth and acne. Take this medicine in the dose and duration as advised by your doctor. Swallow it as a whole. Do not chew, crush or break it. Casodex 50 mg Tablet may be taken with or without food, but it is better to take it at a fixed time. 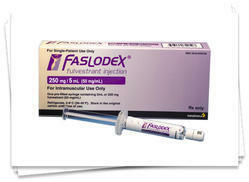 Faslodex 250 mg Injection is used in the treatment of breast cancer. Faslodex 250 mg Injection blocks the action of estrogen on breast cancer cells. This can lower or stop the growth of some breast cancer cells that need estrogen to grow. 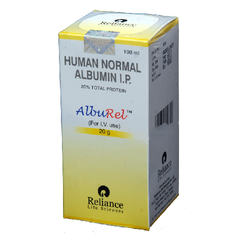 Alburel 20% Solution is a soluble monomeric protein component that is very vital for maintaining the health of tissues, prevents hemorrhoids. It is circulated throughout the body to maintain the health of fluids, blood and other important tissues. It is used in the treatment of fulminant hepatic failure, hypoalbuminemia, hyperbilirubinemia in neonates, hypoproteinemia, hypovolaemia, hypovolemic shock and pyelonephritis acute. It works by increasing the circulating plasma volume, which in turn decreases the hemoconcentration and blood viscosity. Additionally it acts a transport medium for hemin, steroids, thyroid hormones and fatty acids and also binds with other substances like unconjugated bilirubin, calcium ions, etc. Albumin is contraindicated in case a person is suffering from severe anemia, bleeding disorders, high blood pressure, inability of the heart to maintain adequate circulation, esophageal varices and fluid in the lungs. Currently for Alburel 20% Solution no evidence of any adverse effects resulting from interactions with other drugs, herbal supplements, food, etc. have been found. Common side effects from the usage of the drug are hypersensitivity reaction, volume overload, etc. Therefore, a qualified doctor should be consulted regarding the dosage of Alburel 20% Solution as the dosage will depend a lot on the medical history of the patient, preexisting health conditions and drugs the person may be taking. 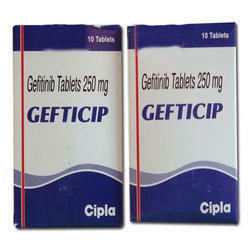 Uses Gefticip 250 mg tablet is used to treat adults with non-small cell lung cancer (locally advanced or distance spread [metastasis]).How it works Gefticip 250 mg tablet blocks a protein called ‘epidermal growth factor receptor’ (EGFR) which is involved in the growth and spread of cancer cells.Common side effects Nausea, Pancreatic inflammation, Liver inflammation, Bleeding, Dehydration, Diarrhoea, Difficulty in urination, Lung disorder, Fever, Hair loss, Increased bilirubin in the blood, Liver enzyme increased, Increased creatinine level in blood, Itching, Dry skin, Loss of appetite, Nail disorder, Eye redness, Eye itching, Sore eyelids, Eyelid redness, Skin reaction, Mouth ulcer, Skin redness, Vomiting, Weakness. 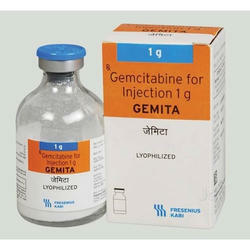 Uses Gemcitabine is used in combination with other drugs for the treatment of local or advanced cancers like non-small cell lung cancer, epithelial ovarian cancer, bladder cancer, adenocarcinoma of the pancreas. 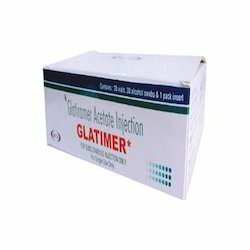 It is also used for treating recurrent breast cancer that cannot be treated with surgery.How it works Gemcitabine belongs to a class of medication called anti-metabolites. It is cytotoxic in nature. They kill rapidly dividing cells (e.g. cancer cells) thus slowing down the spread of cancer in the body.Common side effects Decreased urination, Constipation, Diarrhoea, Fever, Hair loss, Headache, Influenza like symptoms, Loss of appetite, Mouth ulcer, Nausea, Sore throat, Tarry stools, Urine discolouration, Vomiting Mannitol(87.5 mg)Uses Mannitol is used to prevent or treat excess body water in certain kidney conditions, such as oliguric phase (production of abnormally small amounts of urine) of acute renal failure and for reducing swelling of the brain, or reducing pressure in the eye.How it works Mannitol belongs to a class of drugs called osmotic diuretics. Mannitol works by increasing the amount of fluid excreted by the kidneys and helps the body to decrease pressure in the brain and eyes.Common side effects Nausea, Pulmonary edema, Acidosis, Anaphylactic reaction, Chest pain, Chills, Convulsion, Dizziness, Electrolyte imbalance, Fever, Headache, Increased blood pressure, Inability to empty the urinary bladder, Inflammation of vein due to blood clot in the blood vessels, Vomiting. 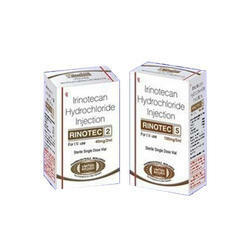 Injection is used to treat excess amounts of calcium in the blood (hypercalcemia) caused by certain types of cancers. 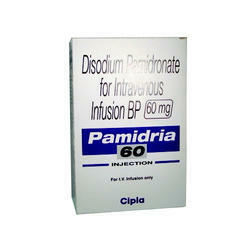 It is also used to treat excess of bone thinning caused by some medications or in elderly people, bone pain and Paget’s disease (excessive breakdown and abnormal formation of deformed bones).How it works Pamidria 60mg injection belongs to a category of drugs called as bisphosphonates that decrease the amount of calcium released by the bones into the blood, thus inhibiting the breakdown of bones and preserving bone thickness and density.Common side effects Nausea, Abdominal pain, Anemia, Joint pain, Atrial fibrillation, Conjunctivitis, Constipation, Convulsion, Diarrhoea, Dizziness, Gastritis, Headache, Increased blood pressure, Decreased calcium level in blood, Decreased potassium level in blood, Decreased magnesium level in blood, Decreased phosphate level in blood, Insomnia, Loss of appetite, Decreased white blood cell count (lymphocytes), Rash, Reduced blood platelets, Sleeping for unusually long periods, Vomiting, Weakness, Fatigue, Fever, Decreased white blood cell count, Increased creatinine level in blood. Purple or red pinpoint spots under your skin, unusual weakness, lower back pain, blood in your urine, urinating less than usual or not at all. 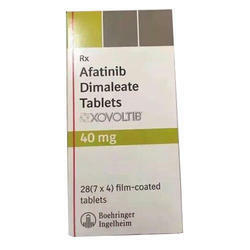 Capiibine 500 mg Tablet is used in the treatment of breast cancer. 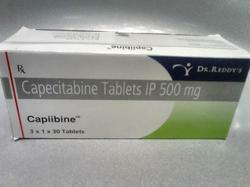 Capiibine 500 mg Tablet is an anticancer medication. It works by interfering with the growth of genetic material (DNA and RNA) of the cancer cells. This slows the growth of cancer cells and eventually kills them. Take this medicine in the dose and duration as advised by your doctor. Swallow it as a whole. Do not chew, crush or break it. Capiibine 500 mg Tablet is to be taken with food. 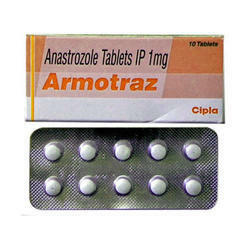 We are engaged in offering high quality Armotraz Tablets to our valuable clients. These tablets are processed using best quality chemical compounds, following industry accepted standards. 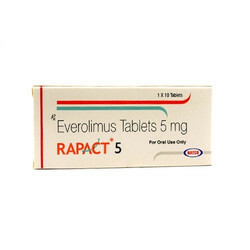 They are indicated for the treatment of breast cancer in postmenopausal women and other conditions. The offered tablets are available in varied packaging options to meet the diverse needs of the clients spanning all over the country. In addition, these tablets are severely tested on well distinct parameters to ensure their quality. new or worsening cough, chest pain, wheezing, feeling short of breath; signs of infection - fever, chills, joint pain, red or swollen gums, painful mouth sores, skin sores, rapid heart rate, pale skin, easy bruising, unusual bleeding, feeling light-headed; kidney problems - little or no urination; painful or difficult urination; swelling in your feet or ankles; feeling tired or short of breath;liver problems - nausea, upper stomach pain, itching, tired feeling, loss of appetite, dark urine, clay-colored stools, jaundice (yellowing of the skin or eyes);any wound that will not heal; or a surgical incision that is red, warm, swollen, painful, bleeding, or oozing pus. 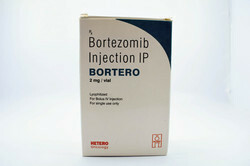 Injection is used to treat certain types of cancer such as multiple myeloma (a cancer of the cells of the immune system in the bone marrow) and mantle cell lymphoma (a cancer of the cells of the immune system affecting the lymph nodes).How it worksBortetrust 2mg injection belongs to the class of drugs called proteasome inhibitors. Proteasomes are proteins which play an important role in growth and multiplication of cancer cells. 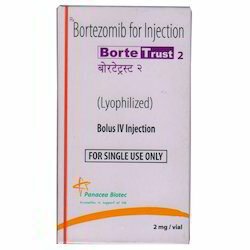 Bortetrust 2mg injection blocks the action of proteasome, and reduces the growth of cancerous (actively growing) cells.Common side effectsNausea, Numbness, Pain in extremity, Rash, Loss of sense of taste, Anxiety, Blurred vision, Shortness of breath, Chest pain, Abdominal bloating, Constipation, Increased blood pressure, Decreased blood pressure, Dehydration, Depression, Diarrhoea, Disorientation (alteration of mental status), Dry skin, Skin redness, Decreased red blood cell count, Eye infection, Facial blushing, Fever, Gastrointestinal bleeding, Generalised swelling, Headache, Increased sweating, Insomnia, Itching, Decreased white blood cell count, Lightheadedness, Loss of appetite, Loss of consciousness, Mood swings, Mouth ulcer, Muscle pain, Bone pain, Nose bleed, Respiratory tract infection, Fungal infection, Restlessness, Agitation, Painful rash, Shivering, Dry mouth, Sore mouth, Stomach pain, Tingling sensation, Burning sensation, Vertigo, Vomiting, Weakness, Fatigue, Weight loss, Liver dysfunction, Renal dysfunction. 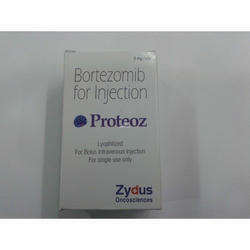 Uses Proteoz 2mg injection is used to treat certain types of cancer such as multiple myeloma (a cancer of the cells of the immune system in the bone marrow) and mantle cell lymphoma (a cancer of the cells of the immune system affecting the lymph nodes).How it works Proteoz 2mg injection belongs to the class of drugs called proteasome inhibitors. Proteasomes are proteins which play an important role in growth and multiplication of cancer cells. Proteoz 2mg injection blocks the action of proteasome, and reduces the growth of cancerous (actively growing) cells.Common side effectsNausea, Numbness, Pain in extremity, Rash, Loss of sense of taste, Anxiety, Blurred vision, Shortness of breath, Chest pain, Abdominal bloating, Constipation, Increased blood pressure, Decreased blood pressure, Dehydration, Depression, Diarrhoea, Disorientation (alteration of mental status), Dry skin, Skin redness, Decreased red blood cell count, Eye infection, Facial blushing, Fever, Gastrointestinal bleeding, Generalised swelling, Headache, Increased sweating, Insomnia, Itching, Decreased white blood cell count, Lightheadedness, Loss of appetite, Loss of consciousness, Mood swings, Mouth ulcer, Muscle pain, Bone pain, Nose bleed, Respiratory tract infection, Fungal infection, Restlessness, Agitation, Painful rash, Shivering, Dry mouth, Sore mouth, Stomach pain, Tingling sensation, Burning sensation, Vertigo, Vomiting, Weakness, Fatigue, Weight loss, Liver dysfunction, Renal dysfunction. 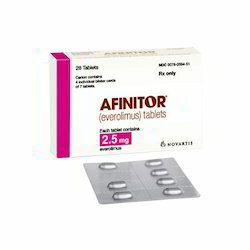 Tablet is used to treat patients with ovarian cancer after failure of first-line of therapy or subsequent therapy and in some cases of lung cancer and cervical cancer where the cancer has recurred after successful initial treatment.How it works Hycamtin 1 mg tablet belongs to class of medications called top oisomerase I inhibitors. It acts by prohibiting the DNA replication and results in death of the cancer cells.Common side effects Decreased white blood cell count (neutrophils), Abdominal pain, Anemia, Constipation, Hair loss, Skin rash, Hypersensitivity reaction, Infection, Loss of appetite, Inflammation of the moist tissue that lines several parts of the body, Nausea, Reduced blood platelets, Decreased white blood cell count, Vomiting, Diarrhoea. 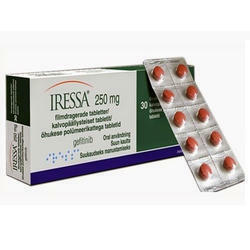 Uses Iressa 250mg tablet is used to treat adults with non-small cell lung cancer (locally advanced or distance spread [metastasis]).How it works Iressa 250mg tablet blocks a protein called ‘epidermal growth factor receptor’ (EGFR) which is involved in the growth and spread of cancer cells.Common side effects Nausea, Pancreatic inflammation, Liver inflammation, Bleeding, Dehydration, Diarrhoea, Difficulty in urination, Lung disorder, Fever, Hair loss, Increased bilirubin in the blood, Liver enzyme increased, Increased creatinine level in blood, Itching, Dry skin, Loss of appetite, Nail disorder, Eye redness, Eye itching, Sore eyelids, Eyelid redness, Skin reaction, Mouth ulcer, Skin redness, Vomiting, Weakness. 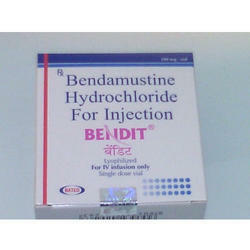 We are offering Gefitinib Medicine to our clients. 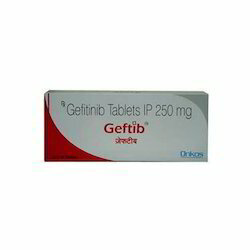 Geftib 250mg tablet is used to treat adults with non-small cell lung cancer (locally advanced or distance spread [metastasis]). How it works Geftib 250mg tablet blocks a protein called epidermal growth factor receptor (EGFR) which is involved in the growth and spread of cancer cells. Common side effects Nausea, Pancreatic inflammation, Liver inflammation, Bleeding, Dehydration, Diarrhoea, Difficulty in urination, Lung disorder, Fever, Hair loss, Increased bilirubin in the blood, Liver enzyme increased, Increased creatinine level in blood, Itching, Dry skin, Loss of appetite, Nail disorder, Eye redness, Eye itching, Sore eyelids, Eyelid redness, Skin reaction, Mouth ulcer, Skin redness, Vomiting, Weakness. 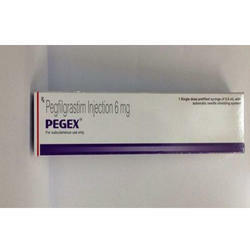 We offer Pegex Injection 6 MG at best prices. We take guarantee of quality and delivery anywhere in the world as per the buyers requirements. Pegex, a synthetic protein, is used to prevent neutropenia due to chemotherapy. The protein stimulates synthesis of white blood cells in the bone marrow, and prevents infections. Can be used along with other types of cancer treatments or other medications to treat pancreatic cancer and non small cell lung cancer that has spread to nearby tissues or to other parts of the body. 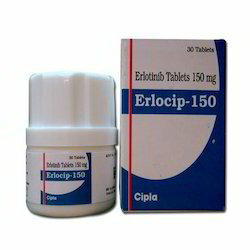 The active ingredient erlotinib belongs to a class of medications called tyrosine kinase inhibitors. The medication works by interfering with the protein epidermal growth factor to prevent it from activating enzymes cancer cells require to multiply, grow and spread. Injection is used to treat patients with ovarian cancer after failure of first-line of therapy or subsequent therapy and in some cases of lung cancer and cervical cancer where the cancer has recurred after successful initial treatment. 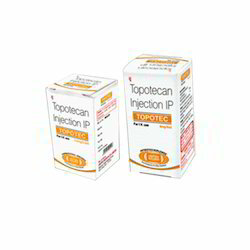 How it worksTopotec 2.5mg injection belongs to class of medications called topoisomerase I inhibitors. It acts by prohibiting the DNA replication and results in death of the cancer cells. Common side effects Decreased white blood cell count (neutrophils), Abdominal pain, Anemia, Constipation, Hair loss, Skin rash, Hypersensitivity reaction, Infection, Loss of appetite, Inflammation of the moist tissue that lines several parts of the body, Nausea, Reduced blood platelets, Decreased white blood cell count, Vomiting, Diarrhoea. Nausea, chills, joint aches, neck pain, or headache may also occur. 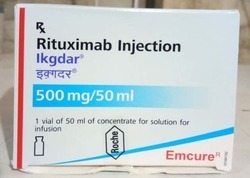 Rituximab is used alone or with other medications to treat certain types of cancer (e.g., non-Hodgkin's lymphoma, chronic lymphocytic leukemia). It is a type of medication called a monoclonal antibody. It works by attaching to certain blood cells from your immune system (B cells) and killing them. It is also used with other monoclonal antibodies and radioactive drugs to treat certain cancers. 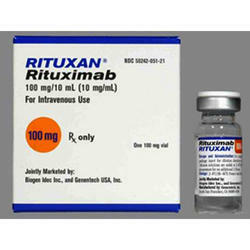 Rituximab is also used with methotrexate to treat moderate-to-severe forms of rheumatoid arthritis. It is usually used for arthritis only after other medications have not worked. It can decrease joint pain and swelling. It is also used to treat certain types of blood vessel disease (such as Wegener's granulomatosis, microscopic polyangiitis).Dosage and Administration:Rituximab is administered by intravenous infusion. Patients should receive acetaminophen (Tylenol) and an antihistamine prior to the infusion to reduce the severity of infusion reactions.Non-Hodgkin's B-cell lymphomas: 375 mg/m2 weekly for 4 to 8 weeks or longer.Chronic lymphocytic leukemia: 375 mg/m2 for the first cycle then 500 mg/m2 every 28 days for cycles 2 to 6.Wegener's granulomatosis or microscopic polyangiitis: 375 mg/m2Rheumatoid arthritis: Two 1000 mg infusions are administered two weeks apart and then are repeated every 16 to 24 weeks. 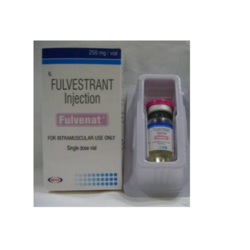 Fulvenat 250 mg Injection is used in the treatment of breast cancer. 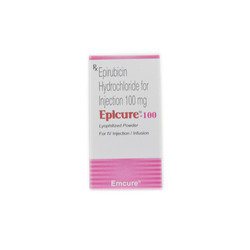 Fulvenat 250 mg Injection blocks the action of estrogen on breast cancer cells. This can lower or stop the growth of some breast cancer cells that need estrogen to grow.